Maycom AR-108 is a small size handheld scanner, which lies comfortably in your hand or in your pocket. The design is practical and the cabinet is covered with rubber. Easy for the user to take it out in field. 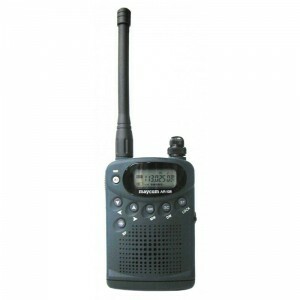 Maycom AR-108 has the two most used radio bands. VHF which includes police and rescue services, and AIR which contains aircraft traffic. Both communication from the aircraft and from the airport control tower. Antenna: 50 Ohm, SMA type.